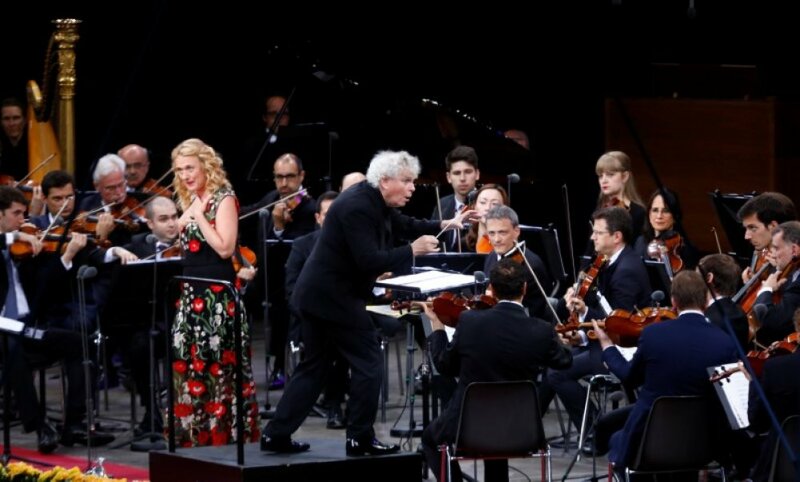 Rattle was joined by his Czech-born wife, the mezzo-soprano, Magdalena Kozena, in a program at Berlin’s wooded outdoor amphitheatre, the Waldbuehne, that included works by George Gershwin, Joseph Cantaloube, and Aram Khachaturian. The British-born maestro, now 63, has already started a new job as music director of the London Symphony Orchestra, but will continue to live in Berlin with his family. The Berlin orchestra was “born in struggle and will always be in that state”, Rattle said in an interview published on the Philharmonic’s website. He said the orchestra was unlike any other he had worked with, more like “an absolutely gigantic string quartet, with all the arguments and verbal violence and frustrations”. Even after a decade-and-a-half in charge, Rattle said it was still a mystery to him how the orchestra worked, but it had ultimately embraced more educational outreach, a wider repertoire and new programming. With live streaming and an appeal to students, the orchestra had shed its elite image and opened itself to be “more cosmopolitan and diverse”, Berlin’s Tagesspiegel newspaper said. “The world has changed an enormous amount. And they are in an incredibly privileged position, whether they realize it or not. I think they are now more part of the beating heart of the city,” Rattle said of the Philharmonic. The conductor thanked “my wonderful orchestra” and “my dear Berlin public” at a performance on Wednesday at the orchestra’s concert hall. On Saturday, thousands of people had braved driving rain to attend a full dress rehearsal, instead of watching the German team play in the World Cup. With 34 performances, Symphony No. 2 by Johannes Brahms was the most played work of Rattle’s tenure, followed by Beethoven’s 9th Symphony, which was performed 26 times. During his years as conductor, 53 new musicians joined the orchestra, and it performed 40 world premieres.